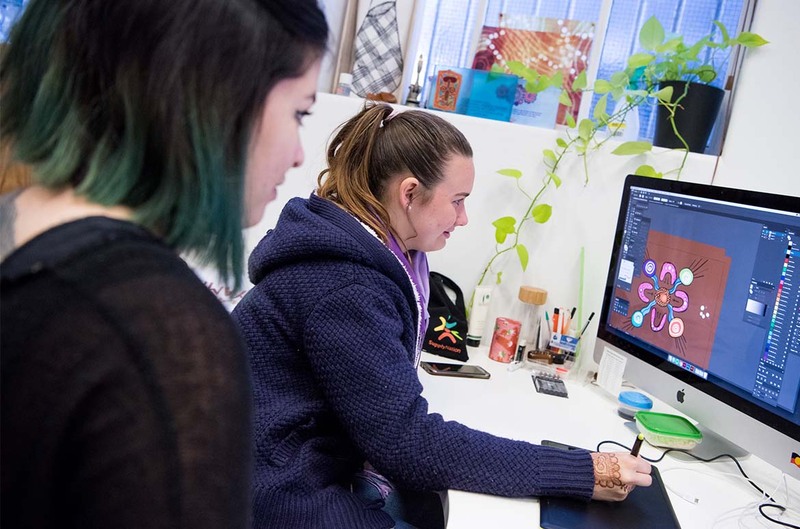 What happens when a bunch of developing artistically talented and deadly Indigenous teens come together for Design Tracks Creative Pathways to work through creative challenges in the company of an amazing line up of Indigenous mentors, educators, designers and artists? They nail it! 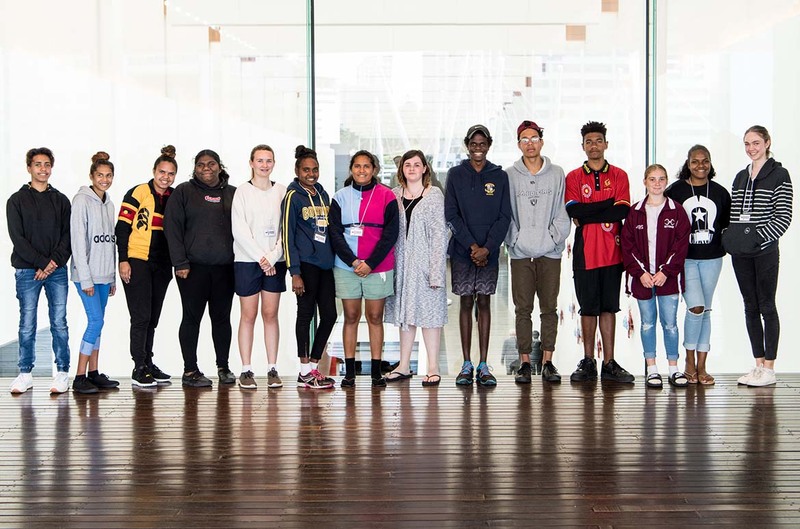 Together, through the Design Tracks Creative Pathways Program presented in July by QAGOMA and the Indigenous design agency Gilimbaa, nineteen Aboriginal and Torres Strait Islander secondary students from Queensland and northern New South Wales schools travelled to Brisbane to engage in the process of “Exploring, Gathering, Creating and Connecting”. During a 3-day and 2-night residency camp the students explored ideas, feelings, beliefs, practices and ways of thinking, and were immersed in doing, creating and presenting. 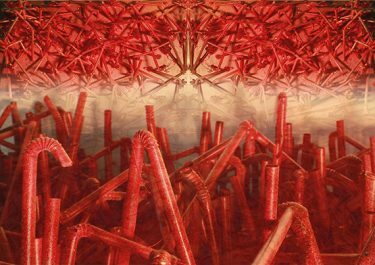 Group workshops focused on printmaking, architecture, textiles and graphic design. 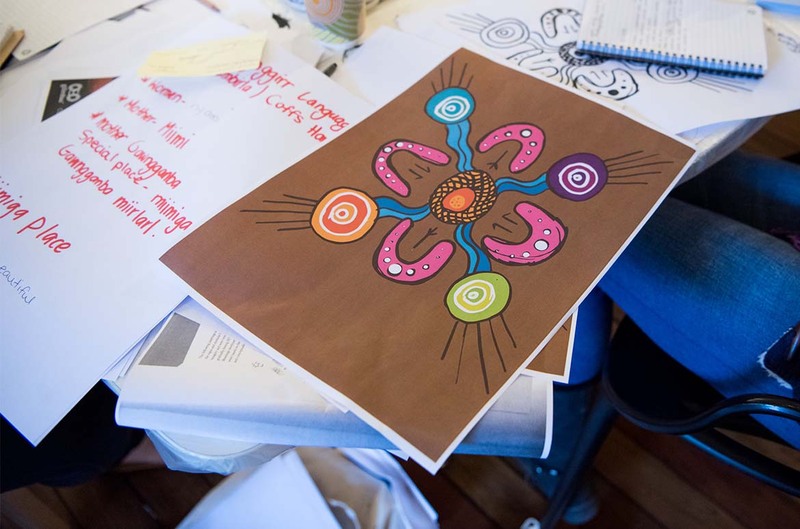 As a supervising teacher at the program, it opened my eyes to the value that was placed on having time to really explore each creative process under the guidance of caring and experienced Indigenous mentors. Being used to the routine of a busy school timetable, I recognised the need for students to have a creative and non- intrusive space to think! 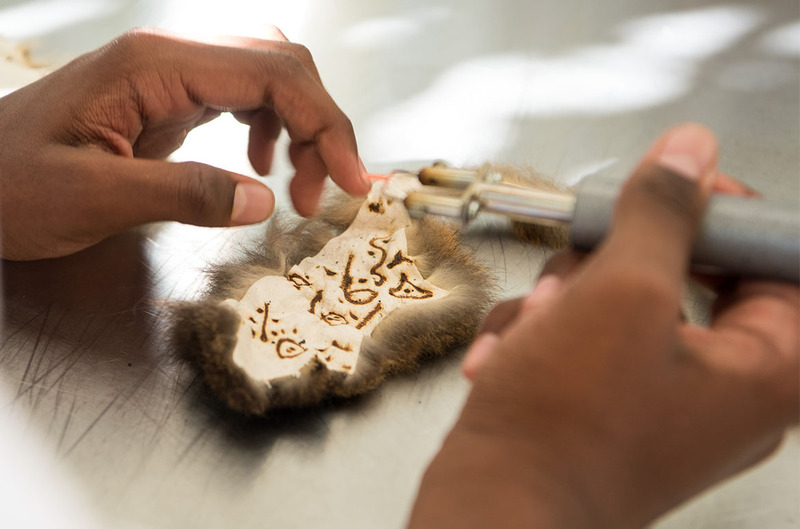 Resisting the urge to ‘think and do for the students’ I learned that this ‘space’ fostered meaningful connections between the students and their making. 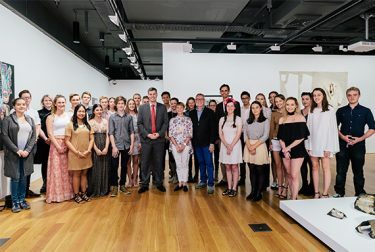 One of the program highlights was to observe the transformative effect that many students felt as they visited the archives of the Queensland Museum. 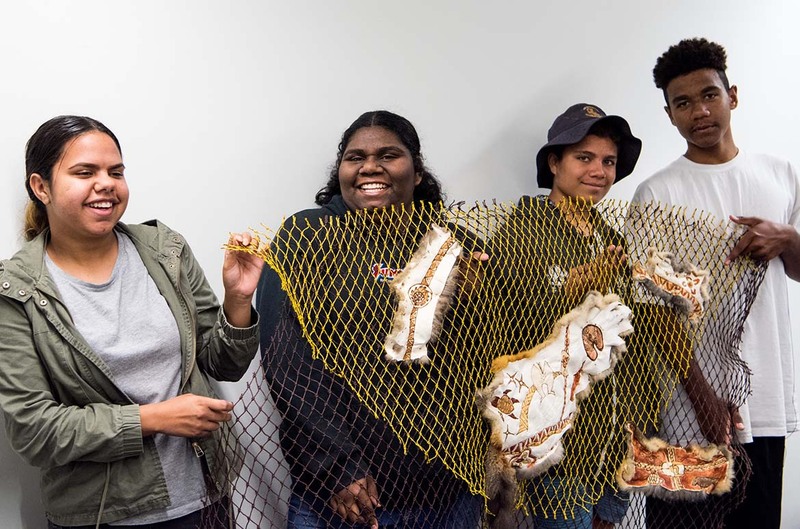 Having only experienced the ‘traditional’ school excursion to a museum or gallery, this diversion from the ‘usual’ became a spine-tingling memory as Indigenous artefacts were brought into view. The memories, experiences, lives, stories and journeys of the artefacts surrounding the students seemed to silently work their way into the memory of each person in the room, confirming a strong sense of belonging, continuity and strength. The Design Tracks program provided students with the opportunity to see each other through the lens of their own experience and then to make new friends, new observations, dream a little bigger, and project themselves into the future equipped with a growing confidence in capacity to succeed. Yes, students were tired, and yes, they worked hard and accepted new challenges, but every effort made was absolutely worthwhile. The shared experiences from the three days have definitely given my students new hope, new directions to explore, new confidence and best of all a greater understanding as to who they are and what they can achieve individually and as a collective. 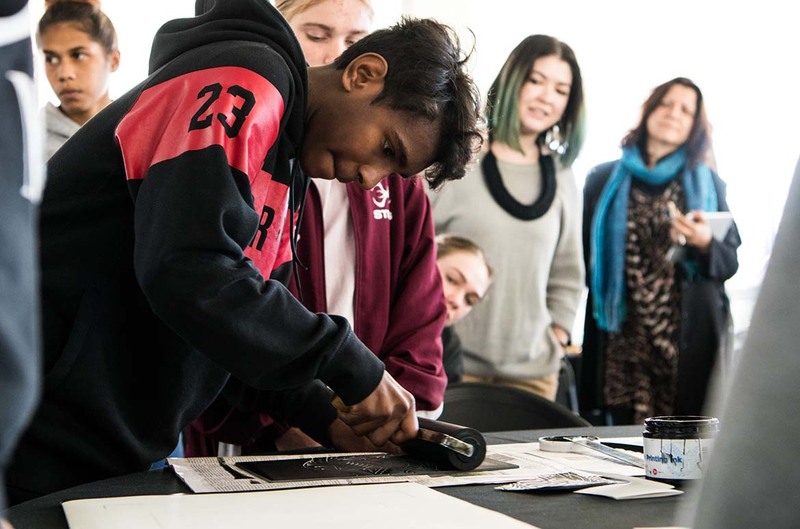 The Design Tracks Creative Pathways Program was supported by an anonymous donor through the Queensland Art Gallery | Gallery of Modern Art Foundation. 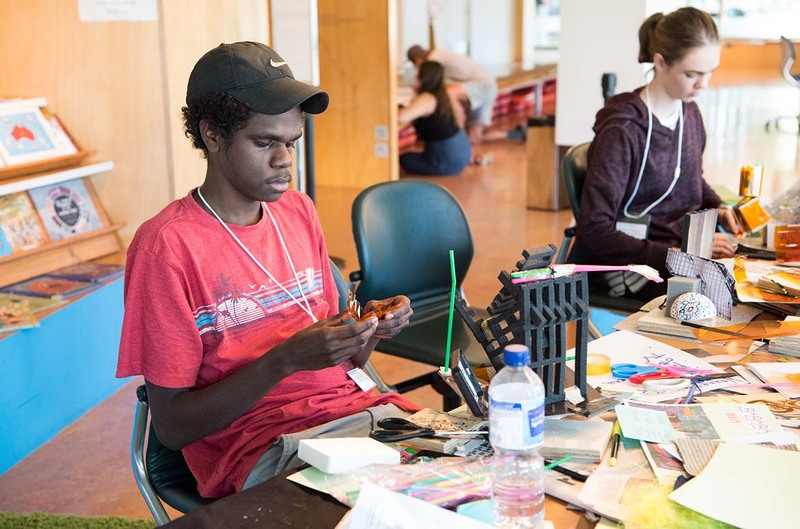 Sincere thanks to teacher Marty Nuku from Hymba Yumba Independent School for reflecting on her experience of Design Tracks Creative Pathways Residential Camp.